Online games are fun and exciting, plus they give players a wonderful chance to win. Video poker has been one of the games that experienced a rapid increase in popularity. Are you about to try video poker for the first time? Use this guide to understand the most important rules of the game and to come up with a winning strategy. The rules of video poker are very similar to the standard rules of the game. In the beginning, the player will have to put a stake in the video machine. A single mouse click will be needed to get the machine going, marking the beginning of the video poker experience. When trying video poker, you will need to get the machine going twice. Practicing and dedicating some time to playing poker will give you a better idea of what it takes to win. You will be dealt a hand of cards. Your first task is to determine which ones you want to keep and which ones you’re going to discard. The cards that you discard will be replaced with new ones by the machine. The new cards will next be measured. A standard poker hand scale is used for the purpose. Thus, you need to make two decisions and you’ll have to interact with the machine two times. Video poker features these standard interactions and there aren’t significant variations across platforms. Though it’s a relatively simple game, getting started with video poker may be a little bit overwhelming. Here’s a step by step guide of everything that you’ll need to do. 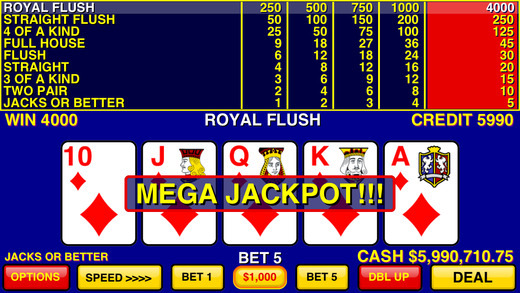 The video poker machine will load on your screen and show you a grid featuring several sections. The first section is dedicated to card playing. The second one presents the payout table and the third one will typically be dedicated to the game logo. A series of buttons located underneath the grid is used to set the stakes. The buttons enable you to customize the exact amount that you’re willing to bet on a particular hand. Most of the video poker machines allow different denominations in terms of betting. There are payline adjustment options, as well. The wager amount is now set. The next step you’ll need to follow involves clicking the deal button, which will start the game. The machine will shuffle the cards and then you’ll get a spread of five. Hold and deal buttons will appear underneath the spread. A hold button will be placed underneath each of the cards, enabling you to decide which ones you’d like to keep. Choose the cards that you’d like to hold and click the deal button. The cards that you don’t want will be taken away and you’ll be dealt the respective number of new cards from the deck. After you click the deal button, you will be shown your final hand for the particular round of the game. If you have a winning hand, you’ll get a chance to participate in a high card showdown. In this round, there will be one card turned up and five cards turned down. The face up card represents the casino. You get to choose one of the five cards. If its value is higher than the value of the house’s card, you will get to double the winnings from the previous round of the game. It’s possible to play the high card showdown two times in a row. If you win both times, your winnings will be doubled twice. In the case of a loss during this round, however, all o the original earnings will be lost. Learning the rules of video poker doesn’t take long. Even if you choose one of the game’s variations, you will quickly get used to the requirements. If you need some additional assistance, you may want to go through the game’s help. You’ll find additional tips and suggestions there.